Both FRE & FNM demonstrate the same chart patterns and move into consolidation phase after heavy trading last month. Both stock prices are above 20D, 50D and 200D MA but volumes are dropping. 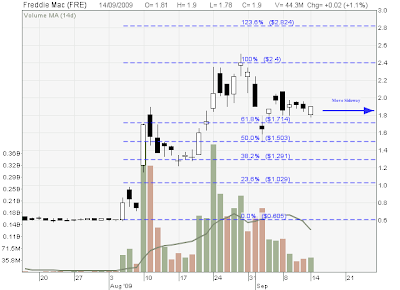 FRE 61.8% Fibonacci support level at $1.714. It is a good entry level for long term investment if the stock price stays above this support line. 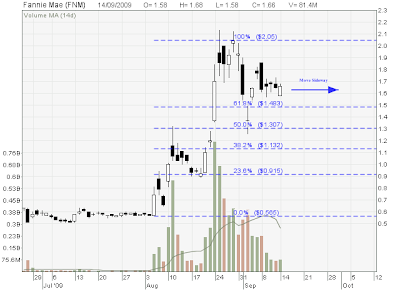 FNM 61.8% Fibonacci support level at $1.483. It is a good entry level for long term investment if the stock price stays above this support line. Note: FRE & FNM do not meet my stock selection criteria. Jaya Holding – False breakout! Jaya had a false breakout (due to lack of volume) and moved back to the consolidation phase again. The stock price is testing the 20D MA support line now and all other technical indicators are not showing any bullish signal. One thing to watch out whether the stock price can hold above the 20D MA support line. 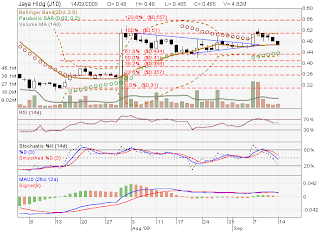 If it breaks this support line, I need to check Parabolic SAR & MACD to confirm whether it is a reversal of the trend.